For something a little more subtle than varying hues of carpet, what about tailoring your wall colours as a room dividing technique? We can picture something really lovely, such as a palette of natural tones gradually changing as room functionality alters. 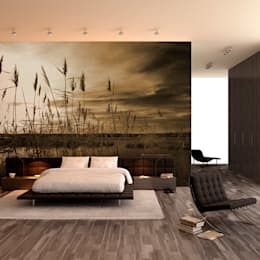 This bedroom is a great example of what we mean, with a natural mural breaking up the space behind the bed, where the en suite resides. Brown in the bedroom fades out into white and cream towards the back of the space and effortlessly splits the open plan zone into two.